This post is a part of the AAHC Forum. In the coming months we will invite current and past grantees to contribute their project experiences via blog posts on our UpNext Blog and then ask you to respond through the AAHC Virtual Forum. We hope you will add your voice and share your needs and opinions so that AAHC can continue to help African American museums thrive. Please visit the AAHC forum to continue the conversation. This is somewhat of a testimonial. You never know when the exact moment will come when you finally feel like you belong. I never knew my moment would come in college, but it did at the Carrie Meek-James Eaton Black Archives Research Center and Museum in Tallahassee, Florida. 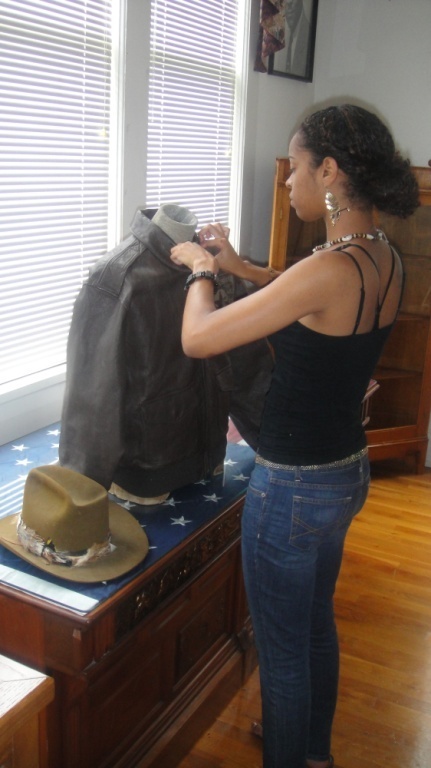 Keila Dumas places the finishing touch on a display for Tuskegee Airman, Roy Spencer. Photo courtesy of the Meek-Eaton Black Archives. I was given the opportunity to train in the Meek-Eaton Black Archives as an I AMM mentee last semester. I will cherish the knowledge I gained forever, and it has enhanced my academic success. I began volunteering in late August and was introduced one by one to the I AMM graduate fellows. Working under curator Dr. Dawson has been a great learning experience for me as well. Each of the graduate students possesses a different personality, drive, and work ethic. They have all made an impact on how I conduct myself as a student, and as an adult in the professional world. As an undergraduate student, seeing graduate students conduct research for their thesis is so inspiring to take in and watch. In the Meek-Eaton Black Archives, I have learned the importance of researching and archival preservation. It has made me a better writer, speaker, and all-around person. The journey has given me the opportunity to become more personal with history, especially black history and the contributions of my African-American ancestors. I have been a resident of Florida since 2003. My home is in Detroit, Michigan, home of the Charles H. Wright Museum of African American History. So, being a history buff is almost genetic. Every one of the I AMM fellows, volunteers, mentors, and professors has a different connection to the exhibits and artifacts located within this facility. There are breathtaking moments, like coming across an original document or picture of someone with your last name. Personal connections with alumni, current faculty, and students are also made our time in the research facilities. Visitors come in all the time and love to share stories about their time in Tallahassee; they always remember us too. Dr. Dawson always makes sure we send “thank you” cards and letters of appreciation to our beloved donors. Without their passion for preserving history, we would not have the knowledge we have. The museum for me went from curiosity, to habit, to my second home. I have learned how to flip an exhibit, create an exhibit, live through the exhibit, and explain the exhibit. All in one semester.